Koi Pond: Fish or No Fish? Many clients who want a waterfall and koi pond do not want koi fish to take care of. Actually, a pond will require less attention with fish than without. If a koi pond has a waterfall to aerate the water, koi fish will produce waste that is broken down by nitrifying bacteria into nitrate nitrogen, and water plants will use the nitrogen and thrive. In turn, the koi fish eat the algae and small water insects that live on the rocks and plant roots. And those bugs eat other smaller bugs that eat microscopic bugs that eat bad bacteria bugs. This is called the nitrogen cycle. A properly balanced koi pond like this will pretty much take care of itself. Koi fish food can get lodged in the plants, rocks and vegetation around the perimeter of the koi pond. If the koi fish cannot find the food, it simply decays, adding unnecessary nitrates to the water and resulting in more food for algae to grow. To eliminate this problem I fashioned what I term as a Koi Fish Food Corral made from a 4 to 5 foot piece of 1-1/2 inch flexible PVC pipe and fastened together with a single 1-1/2 inch coupling, creating a circular corral. This corral keeps the koi food in one place, and prevents it from floating off into rock crevices, plants or the skimmer. Plus it allows for the proper portioning of koi food. It is easy to tell if you’ve given the koi fish too much. If food is still there after a couple of minutes and the koi fish seem to have had enough, they have, and you should remove the leftovers. Lay it in the sun to dry and feed it to them later. It is easy to collect the extra food that the koi fish don’t eat by using a small net. It is better to feed them too little than too much. In a case like this, more is not better. 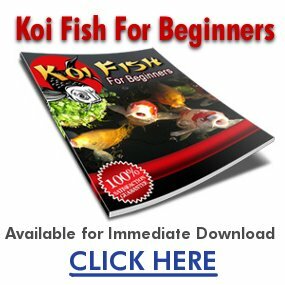 Sometimes my clients originally expressed a concern that koi fish would be a burden or a hassle. They would worry about having to feed them daily, or what they would do when going on vacation. I would explain that the koi fish are extremely important with regard to their contribution to the nitrogen cycle. The nitrogen cycle is what makes a koi pond low in maintenance and nearly self-sufficient. As long as you only stock the koi pond with small fish such as guppies and mosquito fish, they will never need to be fed. They can exist solely on food that the pond provides naturally. A chlorinated pond, on the other hand, requires continuous maintenance. The chlorine dissipates from the water as it flows over the falls and turns into chlorine gas. This means that fresh chlorine needs to be added regularly and your backyard will smell like a swimming pool all the time. The chlorine also causes many minerals and suspended particles to precipitate and build up on the rocks, causing unsightly white stains in the water’s path. When chlorine is not added regularly, leaves and other decaying debris in the pond will cause algae to grow, turning the pond green. So after convincing the client to give my suggestion a try, I returned a few weeks later to find that they have not only purchased some large koi fish, but have given them all cute names, like Charlie and Doug. If the client wishes to have larger fish such as koi, the nitrogen cycle will need a little extra help from a biological filter and an ultraviolet light. The larger the number and size of the koi fish, the greater the waste material produced. This means that some of it must be removed from the water. Increased quantities of nitrates and nitrites increase the amount of ammonia and other by-products such as pea soup algae, the type that turns the water green. A biological filter will aid in the breakdown of toxic nitrites into less harmful nitrates, and an ultraviolet light will kill algae spores and disease-causing pathogens as they pass through the UV light on the way to the filter. So, what else can I say to convince you to get fish? They are fun to watch? They are cute? They come in handy during times of famine? Got fish? Got turtles? Got tadpoles? No? Then, get some! Your pond will be much more appealing and exciting. It is like having the Learning Channel or Discovery Channel in your back yard. Every day brings a new discovery: baby fish hatching; a dragonfly struggling from its cocoon; a tadpole slowly, very slowly, turning into a frog; two crayfish, doing what they do to make baby crayfish… now that is a discovery! A turtle, shedding its shell… now that is a miracle. If you have kids or grandkids, or neighbor kids, grab some or all of them and make it an adventure. Pile them into the car or bus and go to the local pond store and gather up a passel of predacious and peculiar pond creatures. Better yet — build a koi pond first and then do it.